Animals Talk to You - Sharing God's love for Stories! Here is a story about a sheep named Shem. The poem (read/view below) is now an animated video part of a new PMM Project where the animal in the scripture tells what happens from their perspective. It can be used right after the scripture is read so even in this story people may not know the reason for the initial celebration or what the lamb had done to elicit Shem’s jealousy. It is a fictitious story that possibly happened in the flock after the shepherd left the 99 sheep then returned having found or saved the lost sheep in Luke 15:4-7. The Story of Shem the Sheep is a wonderful blend of the parables told in the Gospels of the Lost Sheep, the Lost Coin, and the Prodigal Son. An interesting way to engage young minds about using their imagination regarding storytelling and the stories in scripture. Shem is a jealous sheep in response to the dumb lamb being found and then the plot thickens for him to try to get the shepherd’s love and affection too. Shem didn’t realize that he already had the shepherd’s love and care. He feels a need to be rescued by the shepherd too. So he hatches a plan that resembles the makings of the Prodigal Son (Lost Sheep/lLost Coin) being warmly saved/received by the father in experiencing God’s love. Like scripture these short rhymes have a number of different vantage points of learning like the Parables Jesus shared to give us insight to the essence of God’s nature. We see this as a way to help young people discover the stories of God and his love for us in simple stories that rhyme. It can be done in a fun and caring way to bring a desire for hearing and reading the word of God. Discovering God’s love through story is what it is all about. Here, then, is a story about a sheep named Shem. That evening from the flock he ran. Which sent the wolf off goggle-eyed. One of my flock whose faith was steady. 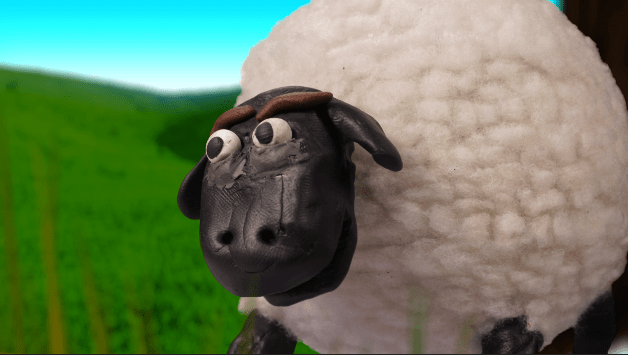 Please feel free to be a new Facebook friend with PMM when you finish viewing Shem the Sheep! You can also contact Gregg Hartung about the Animals Talk Project by contacting him at gregg.hartung@presbymediamission.org or by calling (412) 697-9211.